Today: another Orenz related blog post. My new Orenz reminds me of a summer probably about 30 years ag when I was playing Snoopy and the Red Baron1 (borrowed from a friend) on my Atari VCS 2600. 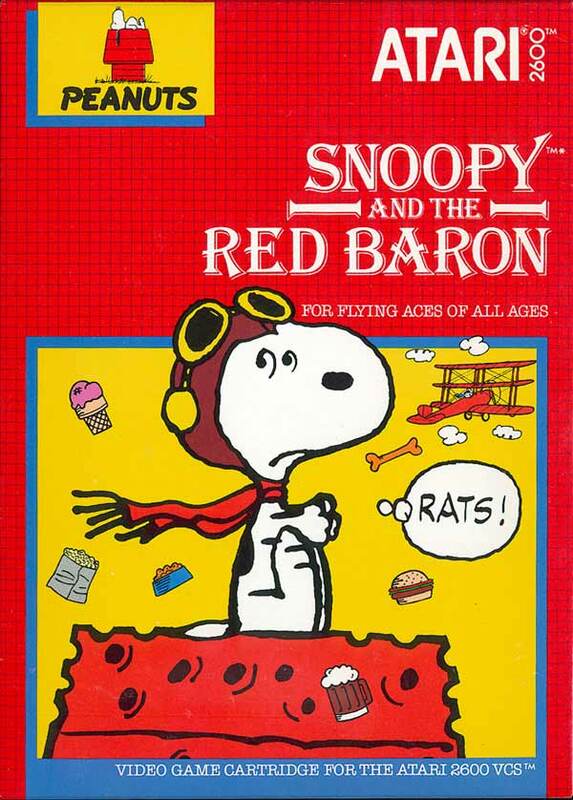 Around that time I also had a red, mechanical Snoopy pencil2. I even think that the Snoopies printed on that pencil were quite similar to the ones you can find on the Orenz. 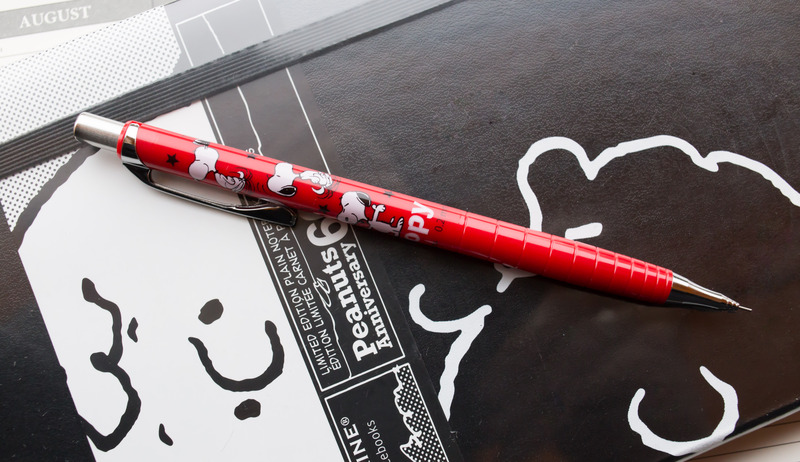 I bought this ‘Vintage Peanuts – Snoopy’ pencil from a Taiwanese eBay seller and paid £11.65 (~ $18; €16.35) – £8.15 for the pencil and £3.50 for postage. Like all Orenz pencil it is great for someone with small handwriting or if you need to make small annotations in documents. This is actually my third Orenz. My blue one arrived in a letter from America, thanks to Shangching‘s generosity and my white one was bought from Amazon for £4.23 (~ $6.50; €5.90). 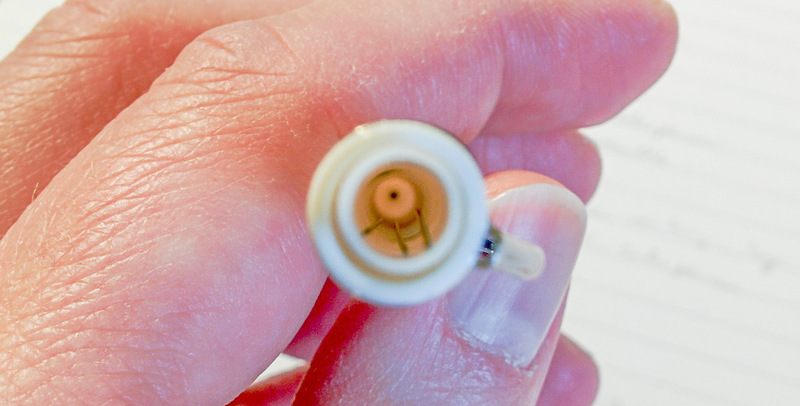 Unfortunately there is one of the problems you will find with 0.2 mm leads that you probably won’t encounter with more traditional mechanical pencils. When I got the white Orenz and tried to use it for the first time the 0.2 mm leads are so light, the static charge of the plastic barrel made them stick to the inside barrel of the pencil and it wasn’t possible to get the leads to forward the normal way. In the end I had to take a lead and feed it though the sleeve / front of the pencil. Once that sleeve was used up the pencil was clogged up, too – but it was then possible to unclog the pencil by disassembling it. Not great, but still much better than the kind of mess I experienced with a Rotring Newton. As usual, please click on the images for a larger version or open in a new tab for a really big version of the image. You can read more about the Orenz in this blog post about sliding sleeves and this blog post about the force needed to slide a sleeve. 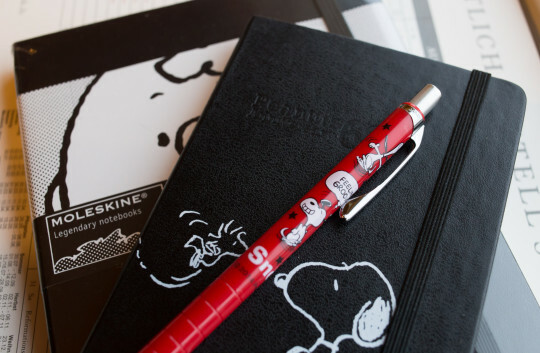 You can read more about the Peanuts 60th Anniversary Moleskine in this blog post. 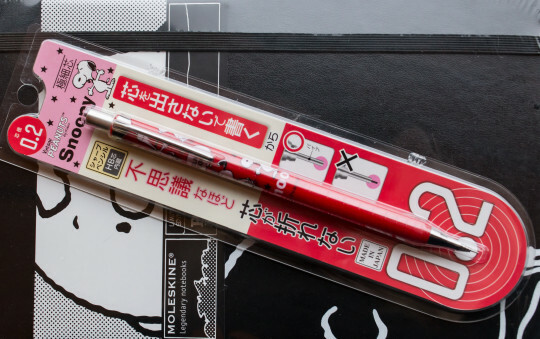 You can find reviews of the Orenz at Lexikaliker (Google Translation), The Pen Addict, One Lone Man’s Pens and Pencils and So I Herd You Like Pencils. The cover of the Atari VCS cartridge has been taken from Wikipedia, where it has been provided by user NBATrades. I believe that the use of the cover falls under “fair dealing” as described by the UK Copyright service.